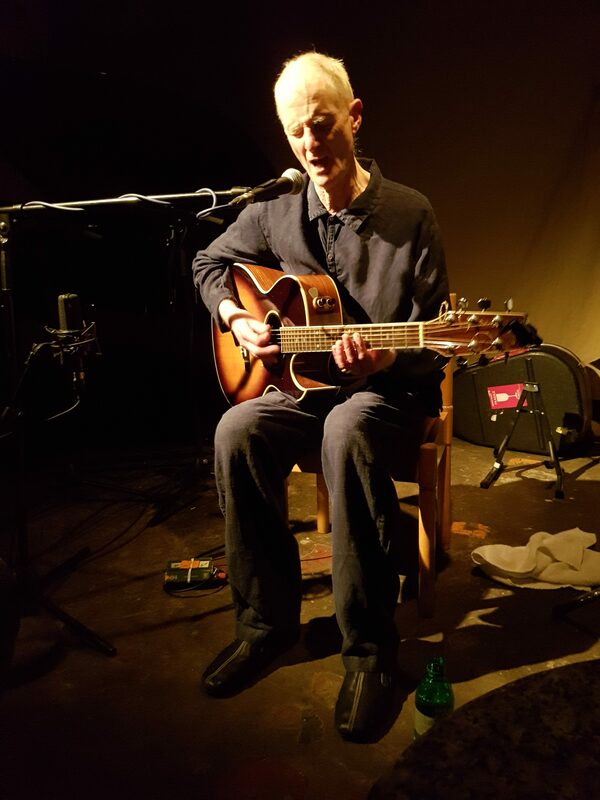 I say Europe because, at least twice in recent times, Hammill has played residencies in Japanese venues at least as small as Cafe Oto, if not smaller. Those who had been feeling left out by Peter’s evident liking for the Far East would therefore have been heartened by his decision to adopt a similar model for this sudden burst of live activity, albeit that it didn’t include the limited edition CDs that were on sale at both Japanese residencies. There were murmurs of discontent from people who were unable to get tickets, and even from people who felt that Hammill should not have been playing such a small venue in the first place. Both objections can, of course, readily be dismissed. Just because Peter can comfortably fill mid-size venues such as the Queen Elizabeth Hall doesn’t mean that he should always have to play in such places, while those who follow him on Twitter and/or subscribe to the PH email discussion group would have encountered few difficulties in securing tickets. Anyway, this residency was everything I’d dreamed of and more, a blazing affirmation of what makes Hammill the greatest and most important songwriter in the world. Having made the (not terribly difficult, it must be said) decision to arrive at Oto a few hours early each day, it was simply astonishing to witness Hammill giving vivid life to his art at such close quarters, literally just a few feet from where I was sitting. With his seventieth birthday on the horizon next year (and how about a celebration concert in November 2018, Peter? ), Hammill is in fine shape both vocally and instrumentally. The voice is as strong and expressive as ever, while the hands carve out dense tone clusters on piano and guitar, lending infinite weight and gravity to the impassioned, allusive texts. Even after almost thirty years of listening to this man, I’m never less than transfixed by the might of his songcraft – by the way the lyrics explode everyday utterances and speech acts into blinding flashes of insight, while the melodies pulsate and recede with a malevolent hammering power. For all Hammill’s evident onstage geniality, this was serious business. The performances seemed to take on some of the key elements of ritual. Hammill has occasionally spoken about the Japanese concept of ma, which refers to “the simultaneous awareness of form and non-form deriving from an intensification of vision”. In the context of live performance, ma exists in the fleeting moment between the last note of the song (when the song becomes not a song) and the reaction of the audience. It’s more than apparent how Hammill senses the presence of ma in the room, as his countenance shifts at the song’s end from rapt concentration to something like solace or relief. Highlights of the second evening, for me at least, included a dramatic “Labour of Love” that saw Hammill absolutely pulverize the piano keys, a transcendent “Your Tall Ship” and an unbearably tragic reading of “(This Side of) The Looking Glass”. Van der Graaf Generator songs were in short supply over the course of the residency, but having rounded off the second night with “Still Life”, Peter kicked off the final night with “My Room” from the same album. The thread made explicit the connections between Hammill’s revered work with VdGG and the less fêted but, for my money, equally star-crossed solo pieces such as “The Lie”, “Shingle Song” and “Too Many of my Yesterdays” that were aired on the final night. If there’s one thing I’ve gathered from attending dozens of Peter Hammill concerts over the years, it’s that he’s never been one for looking back. Refusing any hint of resting on former glories, the home stretch of the last night leant heavily on recent work, as the brilliant “Undone” bled into “That Wasn’t What I Said” and “The Descent”, the latter being one of six new songs played over the course of the residency. With a furious “Traintime” followed by a heartbreakingly beautiful a capella “Again”, he was gone. And so what have we learned? That Hammill’s lifelong preoccupations – reason, memory, the unravelling of time and the choices we make – are deep, troubling ones. That there is something primal and atavistic about the way he confronts them in song. And that fifty years after he began, his music remains as visionary and essential as ever.